Meghan Markle, the Duchess of Sussex, chats with a Moroccan woman at a charity engagement in Morocco. 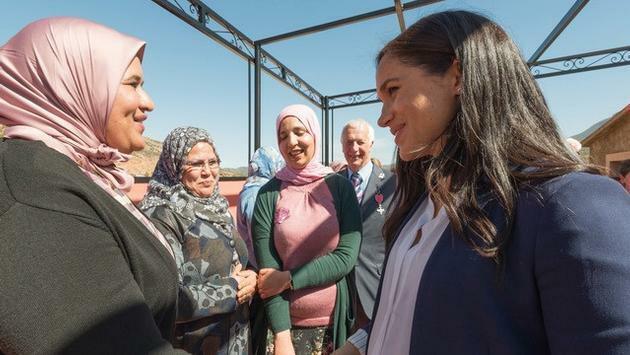 The Duke and Duchess of Sussex have just visited the Moroccan charity Education for All, which educates Moroccan girls from rural areas, aiming to combat the 83 percent female illiteracy rate. This is a cause Intrepid has championed with more than AUD $150,000 to date donated to the charity via the operator’s not-for-profit, The Intrepid Foundation. To celebrate the royal visit, Intrepid Travel will donate CAD $100 to Education For All for every traveller that books the Morocco: Women’s Expedition from now until International Women’s Day on March 8, 2019. “As one of the first female leaders of a travel company in a male dominated industry, I know that education is key to improving gender inequality in Morocco and I was so proud to see the royal couple highlight this cause,” says Zina Bencheikh, Intrepid Travel’s General Manager in Morocco. The Duke and Duchess of Sussex met girls at two Education For All boarding houses including a henna ceremony for the Duchess and a meeting with the charity’s founder Michael McHugo MBE. The travel company’s Morocco Women’s Expedition offers experiences you can only have with local women. It also empowers widowed or divorced women without an income stream to manage small tourism businesses, such as homestays and walking tours that Intrepid Travel visits. The expedition includes stays with Berber women, visiting a female rug-weaver co-op, taking home cooking classes and experiencing a hammam with local women. For more information on the trip, visit https://www.intrepidtravel.com/ca/morocco/morocco-womens-expedition-117509.